LEXINGTON, Ky. — The streak lives on for another year. The Florida Gators extended the nation’s longest active winning streak over a single opponent to 29 games when they defeated Kentucky 14-9 at Commonwealth Stadium on Saturday night. It wasn’t pretty, and it wasn’t sealed until sophomore cornerback Quincy Wilson came down with an interception with just 33 seconds left in the game. Still, the Gators have started the season off with three wins and are 1-0 in conference play. Here are five takeaways from the game and a look at what is looming down the way for the Gators. 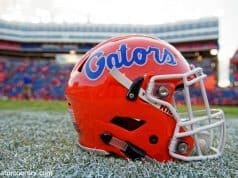 There’s no way to slice this and no sense in trying to be nice here, the Florida Gators special teams are a disaster. Austin Hardin has now missed his last three field goals (34 yards, 35 yards, 34 yards) — with his one attempt against Kentucky getting blocked — and that’s just the tip of the iceberg. Johnny Townsend has over a 40-yarsd average on the season, but he has shanked several punts this season, including one that sailed into the end zone when he had a chance to pin Kentucky deep in their own zone and a short 34-yard kick earlier in the game. Townsend did drop a dime on the two-yard line on Saturday, but he needs to hit the ball with more consistency. Brandon Powell had three returns on Saturday night, averaging 17 yards. The return game has been so bad this season that when Powell brought a kick back 23 yards on Saturday you actually got excited for a second. Punt returning has been non-existent. Antonio Callaway did have a nice 37-yard return against Kentucky that actually was longer than every other punt return that Florida had in the first two games combined. There’s nothing special about these teams right now. Stop me if you’ve heard this one before. The Florida Gators defense needed to reach down deep to pull the offense out of a self-inflicted hole and hold on to the game to clinch a win. When Will Grier threw an interception to J.D Harmon in the third quarter the Gators defense needed to buckle down. They didn’t right away, allowing a 14-play, 75 yard drive that resulted in a filed goal but with Florida’s offense sputtering through the second half of the game, it was the defense that needed to finish the game off and hold on for the win. They did just that, pressuring Kentucky quarterback Patrick Towels and sophomore cornerback Quincy Wilson sealed the win with an interception with just 33 seconds left in the game. Kentucky is far from the best team that the Gators will face. The fact that Florida averaged 3.2 yards per carry and only totaled 120 yards on the ground to a defense that was giving up 221 through their first two games is shocking. 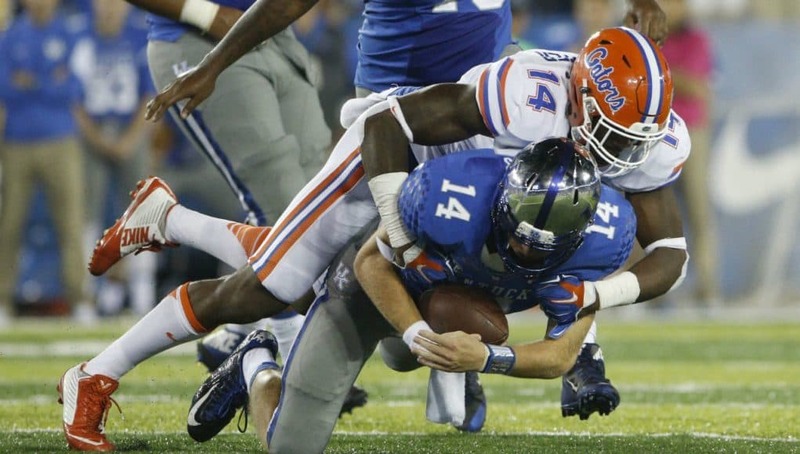 What isn’t shocking is that, once again, the Gators defense will be the driving force for the team in 2015. 3. Quarterback battle not over? Treon Harris spent the entire game on Saturday with his helmet in his hand. This game was Will Grier’s from the start and Harris looked like a guy on the sideline that knew it. We will never know what Jim McElwain was thinking going into the game, but when Grier led a clock-killing four minute drive before halftime that resulted in a touchdown to make the score 14-3, we knew he would come back in for the second half. Then Grier went 1-3 with an interception, throwing for just seven yards in the third quarter. Kentucky made it 14-6 early in the fourth quarter and if McElwain had any intention of playing Harris it would have been right there. Instead, Harris stayed on the outside of the huddle, hands gripping his facemask, the orange helmet hanging behind his back. Grier had two very good drives and looked very good running the football, but he was once again given an opportunity to seize the starting job and failed to slam the door shut. 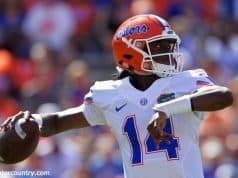 The Florida Gators started two true freshmen (Antonio Callaway, Jordan Cronkrite), a redshirt freshman at quarterback and two sophomores (David Sharpe, Brandon Powell on offense against Kentucky. Cam Knight, Martez Ivey, Fred Johnson, C.J. Worton and Tyler Jordan also played. On Defense, CeCe Jefferson earned his first career start, sophomore Quincy Wilson started as well. Jalen Tabor, Chris Williamson, Justus Reed, Khairi Clark, Caleb Brantley and Duke Dawson also played. 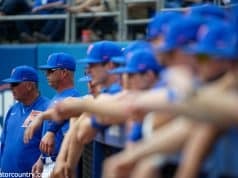 The Gators do lean on some of their veteran players, but the youth movement is in full affect in Gainesville and fans can see that there is hope down the road with the young guys on the roster. Well, Florida is 3-0 as most people predicted they would be before the season. The Gators have been favored in each of their first three contests but now face the most difficult stretch of games on their schedule over the next six weeks. Up first will be a game against Tennessee and it would not be a surprise to see Tennessee open up as a favorite in Gainesville. The Vols have lost 10-straight games to the Gators and lost a heart breaker to Oklahoma two weeks ago but had a tune up week leading up to this game. SEC Nation will be on campus for the game this week in what will be Florida’s biggest test of the season to date. Following that, Ole Miss comes in to town. The Rebels just handed No. 2 Alabama their first loss of the season, beating the Crimson Tide for the second season in a row, the first time Ole Miss has ever done that. Hide the women and children, this game could get on the first weekend of October. After that, Florida will travel to Missouri to face a team that barely beat UCONN at home — this game looks a lot less difficult than it did before the season but Florida has to follow that trip up with a visit to Death Valley — where Les Miles will remind you that it is a place where hopes and dreams go to die. If dreams die in Death Valley, consider Leonard Fournette the reaper. Good luck stopping that. The bye week will give Florida a chance to regroup before they are tasked with stopping Georgia and Nick Chubb. It’s a five-game stretch where Florida’s best-case scenario may be a 2-3 record. The Gators will need to take it one game at a time because looking at that schedule is tear inducing. Previous articleSpivey Senses: What happened in the Florida Gators win?